This is where crockpot cooking is awesome. 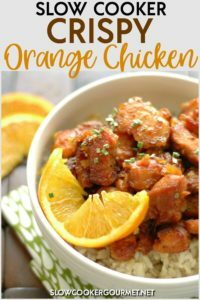 You run out of the oranges you were going to use to make orange chicken and it’s only 0 degrees outside (that’s right…zero!!!) so you are determined you will find something that you already have in your house and make it work. A little of this, a little of that, a little taste…..boom!!! It turns out better than you hoped it would have with the originally planned ingredients. And better yet? 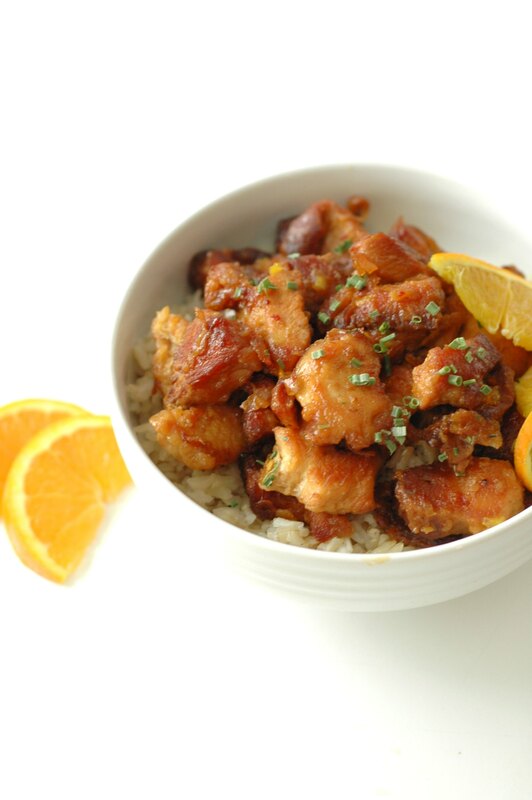 This Slow Cooker Crispy Orange Chicken was easier and healthier than what I had planned! We have about a foot of snow on the ground here and with the wind chills at minus zero school has been cancelled. For three days. In a row. Yep. We are a little stir crazy. But I’m loving the fact that instead of having takeout we had our own healthier version that tasted so much better and didn’t leave me feeling like I was in a food coma from all the MSG and such! So here’s the scoop with the chicken. I wanted it to be crispy but not dredged and coated in a thick layer of flour. So after I cut the chicken into bite sized pieces I put it in a baggie and shook it with a couple tablespoons of cornstarch. With the little bit of water that was on the chicken it basically made a very light batter. So if your chicken is really dry you may need to add just a little water when you shake it up. Then when you put the olive oil in your pan you really need only enough to lightly coat the bottom of the pan. That’s it!! You are not deep frying this…it will be crispy, but light! If you want to skip that step entirely…go for it. I think it would still taste great. It just won’t have that crispy texture. It’s a little extra work but this time around I thought it was worth it for that takeout “fakeout” effect. The base of the sauce was an orange marmalade which turned out to be just right. Not too sweet and it kept the sauce from being too runny or thin. 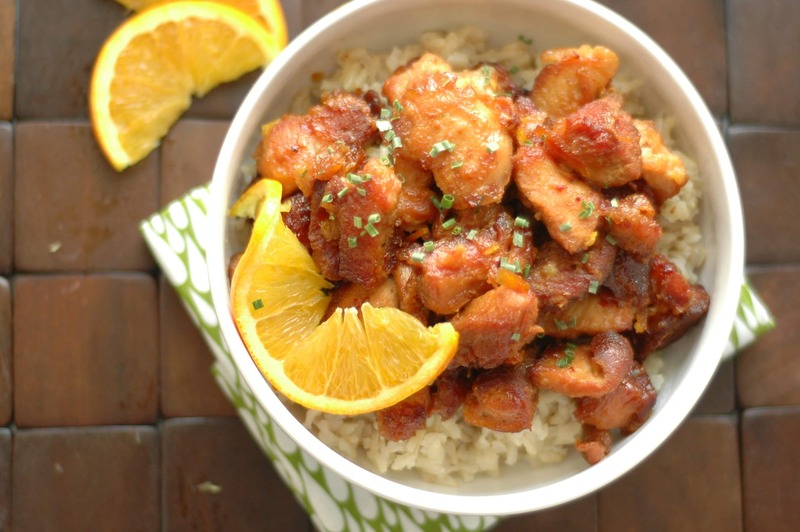 It stuck right to the chicken for an oooey gooey delicious orange chicken dinner. 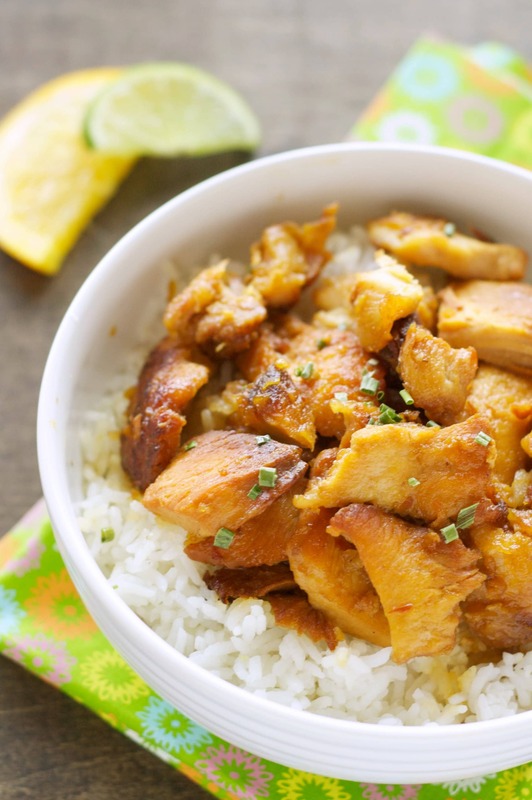 We served this over a brown jasmine rice and had our complete meal in a bowl. I've had a couple of comments that cooked on low for 6 hours the chicken is over done. Since we are cooking this a bit on the stove first it may be best to be conservative and start with 4 hours if your crock cooks very hot (some are hotter than others). Mine was fine even after sitting on warm for several hours but every crock pot is different! I also, like a commenter above, could not seem to achieve a thick sauce. I also could not seem to get the batter to work. Two pounds of chopped chicken and the suggested amount of cornstarch just made a really light coating that didn’t brown for me. Would you suggest maybe dipping pieces in cornstarch instead of the bag method? I’m wondering if the lack of batter was causing my other problem. 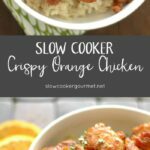 Could I not pre cook the chicken and just cook it for longer in the slow cooker? Yes. However you won’t get the crispy effect of the chicken. 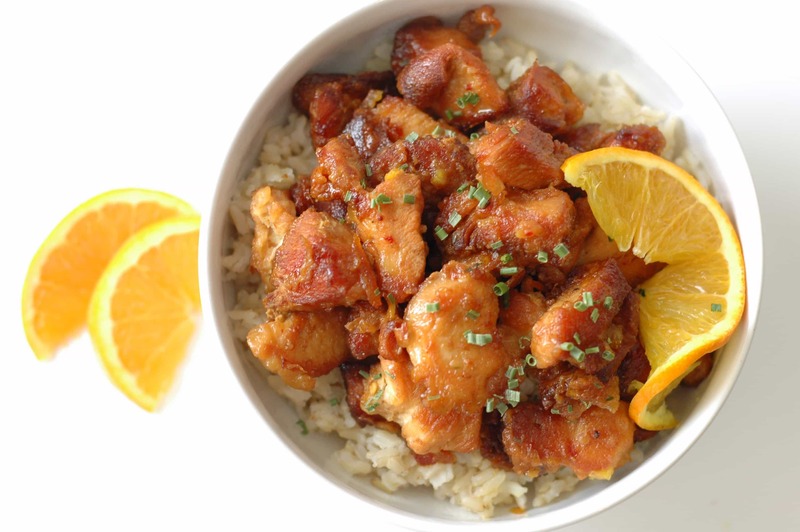 But, you could have shredded orange chicken instead and I think it would still be tasty! Had this on the go now for four hours and the sauce isn’t sticky, it’s runny. Anyone got any advice to save it? Did you happen to swap out any ingredients from the original recipe? There’s not really any ingredients prone to be runny in this recipe so that has me stumped. 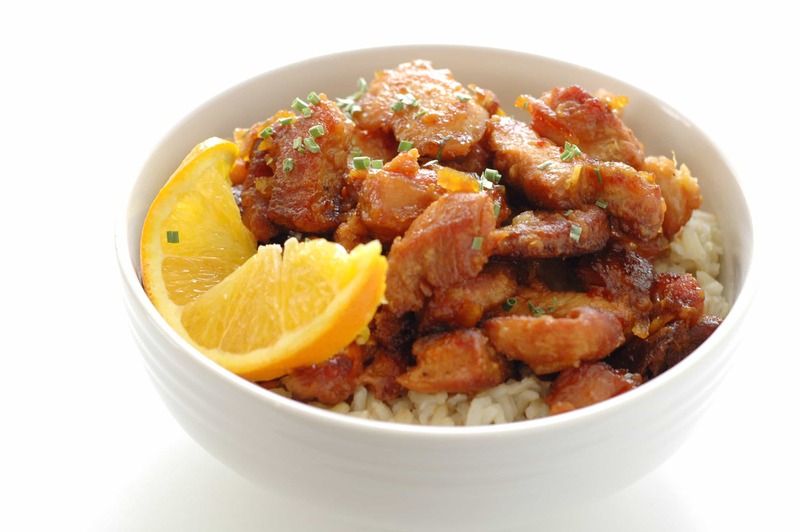 The orange marmalade plus the cornstarch from when you brown the chicken usually make a nice thick sauce. 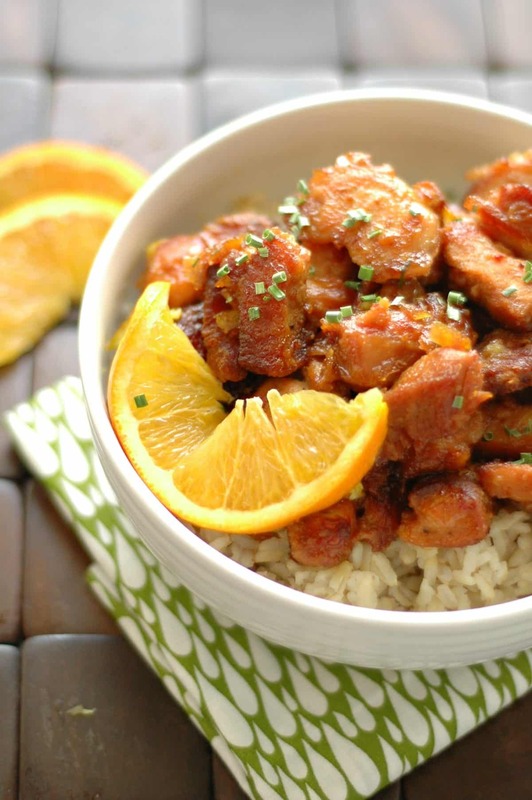 You can always try to thicken your sauce with a little more cornstarch or marmalade. 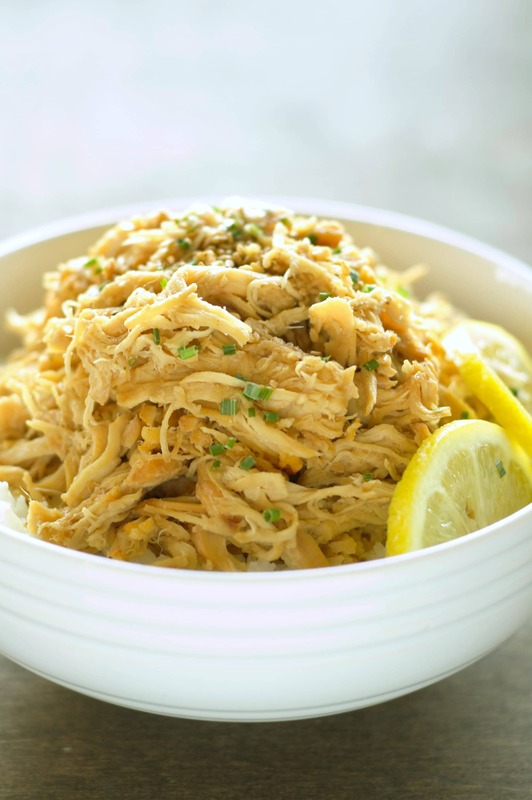 I suggest not cooking the chicken in the skillet before placing in the crock pot – the chicken turned out SO over cooked leaving many pieces too hard to eat. Raw chicken will cook just fine for 6-8 hours on low. Delicious sauce, though!